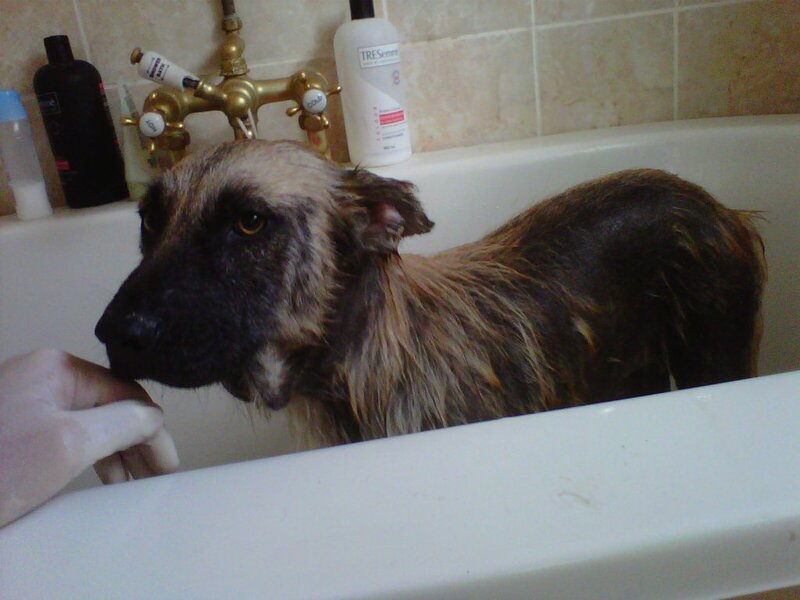 Just Another Stray Dog Story: A Bath! I suspected Max wouldn't enjoy bath time, he doesn't like walking on the wet lawn and makes sure he is well out of the way when the hosepipe comes out. Unfortunately for him yesterday was bath day, and he wasn't impressed. The mange treatment seems to be knocking him for six. He didn't eat and was very drowsy after the Ivermectin injection on Thursday, spending most of the day in his kennel. 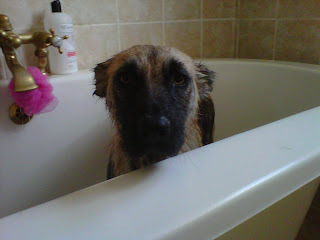 Because the vet told me that the Ectomex dip would have similar side-effects I waited until Sunday to bath him. Thought I would give him a day to get his strength back before knocking it out of him again. The treatment involves 6ml of Ectomex in 1L of water, which needs to be applied all over his body, left to soak for 10 minutes then rinsed. The Ectomex stinks, like peroxide, and requires me to wear surgical gloves. Like his trip to the vet last week, Max was very calm and well behaved in the bath, he didn't growl, bear teeth or even look like biting me, even though he clearly hated every moment of it. He made a half-hearted attempt to escape at one point but mostly sat there looking sheepish. For a street dog he has a remarkable temperament. The little fur he has was all fluffy when he dried off and looked really funny. He is lethargic again today, but eating. He has another vets appointment to look forward to on Thursday (another Ivermex injection) and another bath this weekend. Lucky boy. Love love love hearing the updates on Max. Well done on his progress. I'm in love with him already. Looking forward to more posts!!! That dog has such beautiful eyes. reminds me of my dog that we had to put down after 13 years a year ago. When he looked at you, it was almost like he could read your mind! Thank you for being such a kind and caring person to this lost little dog.